I had the pleasure of photographing a wonderful family this weekend just in time for Mother’s Day! Jessica reached out to me after seeing photos from a recent family session I had done around Easter time. Word of mouth is much appreciated in this business, and it is always a great feeling when you discover that is how people came to book you. 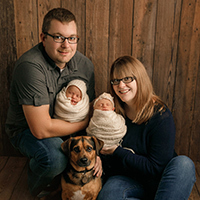 I met Jessica, her husband and two children at their home for this session. It is not too often that clients request photos in their home or on their property, so this was something I was looking forward to. New places get the creative juices flowing because you never fully know what to expect. The Smith’s had a great wrap-around porch that I fell in love with, so we started our session there. We moved out onto their property for more and even grabbed a chicken for one! They were a pleasure to work with, and I am so pleased with how their images turned out. Happy Mother’s Day, Jessica!